In today’s world, time is starting to become harder and harder to find. It’s challenging to find time to devote to close friends and family; it’s difficult to find time to cook for yourself or for your whole family; and sometimes, it’s tough to find time just for yourself. With everyone’s busy schedules, sometime it seems impossible to cook food that’s actually healthy for you – especially with all of the quick fix, processed options available. Oftentimes, we are usually in route to an activity after work rather than going straight home, which can lead to convenient, yet poor food decisions. To help save money and to stay healthy, meal prep on Sunday evenings and set yourself up for success for the week. We’ve listed our top three tips to successfully meal prep and get through the week stress-free and healthy! The first thing to do is make a goal for yourself. Whether it’s saving money, or eating healthier, prepping lunches helps you achieve both. Start by making a menu for the week. Use your JLD cookbooks and sites like Pinterest to find easy meals that are fun to make and that you won’t get bored with. Ensure you have at least 1-2 salads each week to switch things up and make the prep that much easier. Think about whether or not you want to use leftovers. This is a great time-saving technique – just double your dinner ingredients to ensure you have enough left for lunch the next day. After you grocery shop, organize your food and get to work. 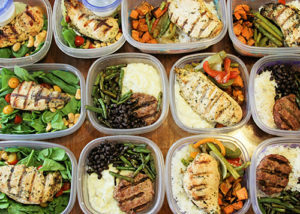 Get all of your meal prep containers out and ready to pack. Make the food in batches. If you’re cooking chicken, marinate and cook it all at once. Will veggies be on your menu? Chop them all together and sauté or separate them into their separate containers at one time. This helps you portion everything out and gives you a good idea of how much you’ll need to complete 5 days worth of meals. Although you may spend time meal prepping, it’s easy to forget your lunch at home or you bring it to work with good intentions, but end up eating out with co-workers. If you make a plan, part of completing it is sticking to it! Remember, your goals and why you’re doing it in the first place to keep you on the right track. Mark your calendars for Summer 2019 when you can purchase our latest cookbook, Centennial Celebrations! If you would like to receive more information about Centennial Celebrations presales and release date, sign up here. You can also order our five other award-winning cookbooks here.